Berlin is exciting, because it is a city of constant change, and places that were once fatally dangerous no-man’s-land are now spaces filled with happy people enjoying themselves. 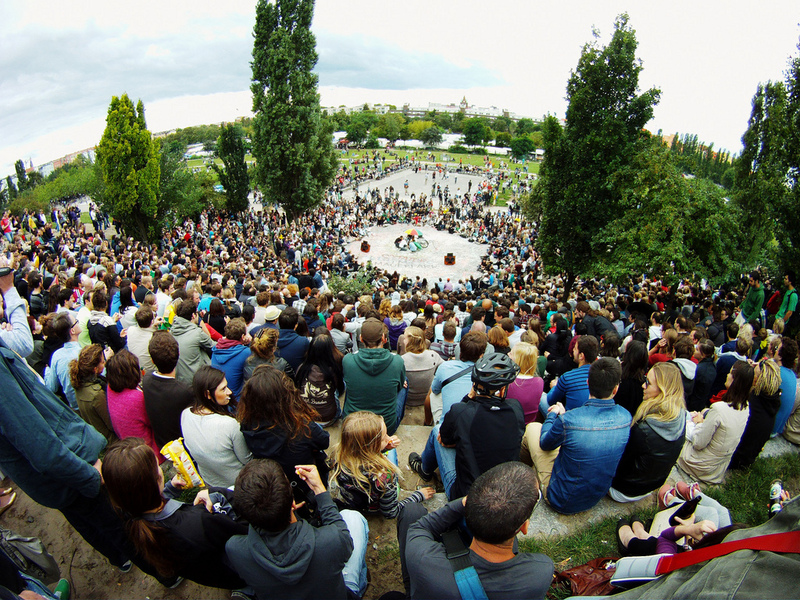 One example for this radical change in function and meaning of public spaces is Berlin’s Mauerpark. We will tell you all about it in this week’s episode. So today, Mauerpark is one of the city’s most favorite hangout spots for summer, and you will almost feel like you are at a festival when going there on a Sunday afternoon. This atmosphere nearly makes it impossible to imagine that this place which is so full of life and fun used to be part of a terrible place where many people lost their lives – the deathstrip. The deathstrip was the inner-German border fortification reaching from the Baltic Sea all the way down to the Czech Republic, separating the GDR from Germany. And as you now, Berlin being the capital city was as well divided by the wall and the deathstrip between 1961 and 1989. Check out our talk below to learn more about the old border strip. Mauerpark only became a public park the 1990’s. After the Wall came down and the country was reunified, the border strip had no use anymore. The place, which has only been accessed by security guards throughout the previous 28 years, naturally became a meet-up place for the people in the city. In 1994, Mauerpark was opened in the design as we know it today – so you see, it’s a rather new place. Don’t you also think that it’s such a cool idea to transform the previous border strip into a meeting place for everyone? Berliners love their Mauerpark madly. And why wouldn’t they? Picnicking and sunbathing on the former deathstrip. Isn’t that almost unimaginable? So make sure to use the next sunny day to walk our talk in Mauerpark!